Heritage Glass is currently involved in Prima Tower – a new 70 storey residential tower opposite Melbourne’s Crown Casino. Our contribution has spanned several exciting projects, including expansive lacework floral wall hangings that add a unique layer of texture to each foyer. Made from aluminium sheet, these were designed to suit curved areas, to be suspended from ceilings, and soon, to be installed on rollers to create a curtain effect. Heritage Glass was charged with the design and construction of these elements based on the architect’s intent and specifications, and they were manufactured locally by our parent company, Schiavello. Heritage Glass is also involved in the supply and installation of all shower screens and mirrors within the Prima Tower apartments. We have currently completed up to Level 35, and will continue to complete 14 apartments per floor for the full 70 levels. With each bathroom slightly different in shape and size, the project has called for the highest degree of precision in measurement delivery, and organisation. 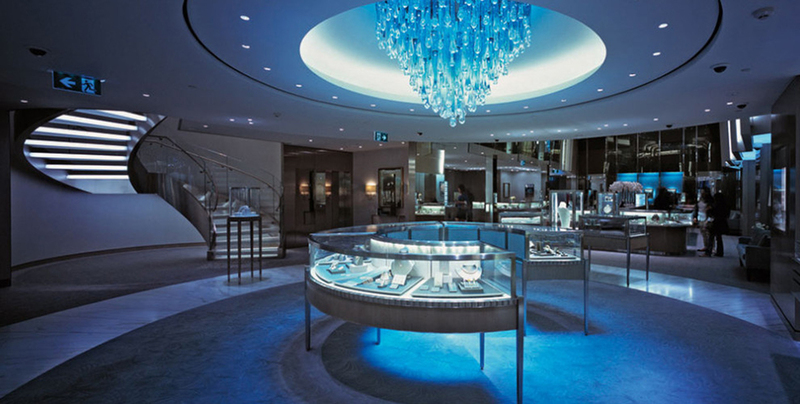 Tiffany & Co.’s Melbourne retail space features glass work by Heritage Glass. Sourceable looks at Tiffany projects across Australia in the lead up to the opening of the new Adelaide store. Heritage Glass has relocated from its Port Melbourne location to a 3,000sqm production facility in Airport West. Now based at Unit 9 / 504-510 Fullarton Road, Heritage Glass offers factory glazing and window fabrication capabilities, and provides the highest level of quality control for its products, fabrication, and processes from dispatch to install. With the ability to assemble in-house, Heritage Glass can bring together all glass products and related components for a project, provide the delivery and on-site installation, and offer effortless end to end coordination.